I built my first website back in early 2000s. It was a photo homage to an actress, who, at the time, I believed to be worth the effort. Remember this was the time when there weren't that many sites around, fewer still that were that niche. Yet I racked up 55,000 hits on the photo heavy, IP-suspect site. But look at the thing, it looks ugly. Starting with just a notepad, and I am guessing, a badly calibrated monitor, I churned out the three framed monstrosity in double quick time. This site died, finally, when Geocities shut down. The wayback machine has the only sign of this site ever existing. Things moved on when I got my own domain. 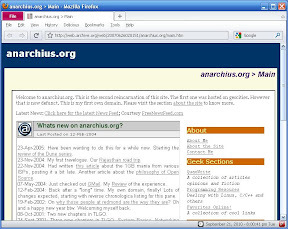 This contained the first version of the site anarchius.org. Not as ugly as the other one, but still a template built from scratch and lacking in any form of sophistication. Using almost no images, the template relied on colors to spruce it up. And over time, it had started to look more and more clunky. And dull. 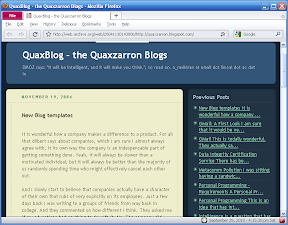 It was around this time, in May 2002, when I published by first blog post. After dabbling around in a super simple template for a while, this became my template of choice for a number of years. Eventually the site and the blog unified, using a template that looks a lot better (having been created by someone other than me). And I still continue to build all my pages by hand - both my blog template and my site pages. Gives me something to work on - and keeps the code clean as a whistle. Given that this is going to officially be the post number 150, I figured this was as good a time as any to go look for some screen shots from history of the blog and the website, and reminisce.